"Sleepy Eye" redirects here. For other uses, see Sleepy Eye (disambiguation). 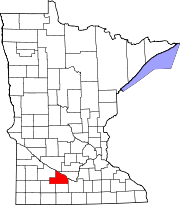 Sleepy Eye is a city in Brown County, Minnesota, United States. The population was 3,599 at the 2010 census. Sleepy Eye took its name from Sleepy Eye Lake, and that was named after Chief Sleepy Eye who was known as a compassionate person with droopy eyelids (or maybe just one). The Chief was one of four Sioux Native Americans (four Ojibwe also attended) chosen to meet President James Monroe in 1824 in the nation's capital. Later, Sleepy Eye was an integral player in the 1851 signing of the Treaty of Traverse des Sioux, which gave all of the land but a 10-mile swath on each side of the upper Minnesota River to the U.S. government. His recommendations to traders led to the successful settlement of Mankato, away from flood areas, and the Chief eventually settled his people near the lake now known as Sleepy Eye Lake. Sleepy Eye was platted in 1872, and incorporated as a city in 1903. According to the United States Census Bureau, the city has a total area of 2.02 square miles (5.23 km2), of which 1.75 square miles (4.53 km2) is land and 0.27 square miles (0.70 km2) is water. As of the census of 2000, there were 3,515 people, 1,479 households, and 942 families residing in the city. The population density was 2,099.9 people per square mile (812.7/km²). There were 1,591 housing units at an average density of 950.5 per square mile (367.8/km²). The racial makeup of the city was 94.03% White, 0.23% African American, 0.06% Native American, 0.34% Asian, 3.90% from other races, and 1.45% from two or more races. Hispanic or Latino of any race were 7.80% of the population. In the city, the population was spread out with 28.0% under the age of 18, 6.8% from 18 to 24, 26.0% from 25 to 44, 19.9% from 45 to 64, and 19.3% who were 65 years of age or older. The median age was 38 years. For every 100 females, there were 92.5 males. For every 100 females age 18 and over, there were 87.3 males. Every August the residents of Sleepy Eye host the annual Corn Days event, where free buttered corn is provided, as well as live music, a flea market, parade, and various other events. Residents of Sleepy Eye made national headlines in the early 1990s for trying to ban MTV in the town. On the television series Little House on the Prairie, Charles Ingalls sometimes made deliveries to Sleepy Eye, which was portrayed as the nearest larger town to Walnut Grove, Minnesota, where the Ingalls resided. It was also the (fictional) home of the blind school that Mary Ingalls and her TV-husband, Adam Kendall, ran later in the series. U.S. Route 14 and Minnesota State Highways 4, and 68 are three of the main arterial routes in the city. Helen Fischer, signer of the Alaska Constitution, was born in Sleepy Eye. Ralph Jon Fritz, longtime sportscaster for WCCO Television, was a native of Sleepy Eye. Dana Kiecker, former Major League Baseball pitcher, was born in Sleepy Eye. Bernard F. Mathiowetz, Wisconsin legislator and lawyer, was born in Sleepy Eye. John Louis Nuelsen, former Methodist Pastor, college and seminary professor, theologian, author, editor. Ingerval M. Olsen, Minnesota Supreme Court justice, practiced law in Sleepy Eye. Wyatt Craft, Member of the U17 USA National Football Team. 1901 W. W. Smith House (NRHP), 2010. 1901–20 Sleepy Eye Milling Company (NRHP), 2011. 1902 Chicago and North Western Depot (NRHP), 2010. 1887 Winona and St. Peter Freight Depot (NRHP), 2012. ^ Chicago and North Western Railway Company (1908). A History of the Origin of the Place Names Connected with the Chicago & North Western and Chicago, St. Paul, Minneapolis & Omaha Railways. p. 125. ^ Upham, Warren (1920). Minnesota Geographic Names: Their Origin and Historic Significance. Minnesota Historical Society. p. 71. Wikimedia Commons has media related to Sleepy Eye, Minnesota.